Ubisoft says that Skull & Bones will have a narrative campaign as well as the multiplayer we've seen so far. 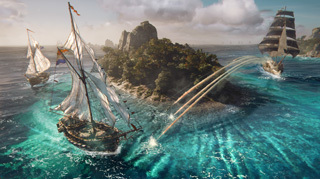 All of the E3 footage we saw from Ubisoft's new pirate game Skull & Bones was focused on the game's multiplayer. We saw teams of pirates facing off against one another in a race to claim the most loot. But Ubisoft says that's not all there is to the game - there's a narrative campaign as well. In an interview with PC Gamer, an Ubisoft rep said that the E3 demo, "only showed Loot Hunt, one of our PvP modes in Disputed Waters. We like to say that this is just the tip of the iceberg of what we have to show for Skull & Bones." The rep went on to say, "[Skull and Bones] will offer a narrative campaign which will be integrated into the game and will not be something aside of the multiplayer experience. In this campaign, players will encounter iconic characters and memorable rival pirates. More details will be shared at a later date." It's an interesting statement, because the rep said that the campaign wouldn't be "aside of the multiplayer experience." That implies that the campaign might be part of the open world, maybe in a similar vein to how The Division works with its PvE and PvP zones side by side.